Fascin is the major actin crosslinking protein found in a wide range of filopodia . This protein has been shown to work in concert with other cross linkers such as α-actinin to produce filopodia, although fascin itself is sufficient to form filopodia-like bundles in a reconstitution system . Moreover, fascin and α-actinin are observed to co-localize at the base of filopodia, where together they can produce a mechanical response of greater magnitude than when acting alone . Cells harboring defective fascin create less filopodia and their mechanical properties are drastically compromised . In lamellipodia-like structures, fascin is suggested to organize the actin cytoskeleton at the leading edge to promote cell motility . Protein structure A 55kDa globular protein that is a component of the crosslinking actin filaments functional module. Fascin organizes F-actin into tightly packed parallel bundles approximately 8nm apart. It also promotes side-branching of actin filaments and can crosslink actin filaments without forming bundles . Metazoans contain three fascin forms (e.g. fascin-1, -2, and -3) encoded by three separate genes while invertebrates contain a single form of fascin (reviewed in ). 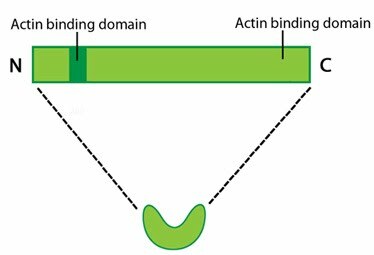 Fascin contains two actin-binding domains (ABD), one located at each end of the protein (see figure below) . Fascin binds to actin filaments with a stoichiometry in a range of one molecule of fascin to 2-3 molecules of actin (in brain tissue)  or 1:4 (in vitro) . A steady pool of F-actin monomers or loosely linked F-actin promotes efficient polymerization and bundling of actin-filaments by fascin (reviewed in ). Fascin phosphorylation at the amino-terminal actin binding site by protein kinase Cα (PKCα) inhibits its ability to bind actin (at both sites) and to form bundles . Although fascin undergoes frequent cycles of association and dissociation rather than binding to actin filaments stably, this process is independent of the phosphorylation state . The rate at which fascin dissociates from actin is slow and appears to contribute to the reduced movement of actin filaments and bundles i.e. increased stiffness of the actin network . Fascin is found in the most distal regions of filopodia and lamellipodia and the cellular distribution of fascin within actin bundles (e.g. microspikes and stress fibers ) appears to vary depending upon the extracellular substrate ; however, specific details about how this distribution and assembly on the actin filaments is regulated remains largely unknown . What other proteins/factors facilitate actin crosslinking?